When you have a business and the roof develops problems, it can be tough to know what to do. 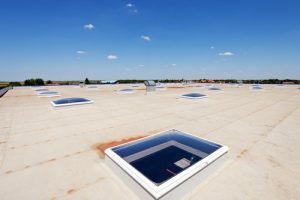 While commercial or industrial roofs generally last for a very long time, problems may eventually arise. Our commercial roofers in Atlanta can help you decide whether the best solution is to re-cover, make repairs, or replace the roof. How much of the roof is damaged, and what’s its condition overall? Are you looking for a permanent or temporary solution? Is the building in question currently occupied? Does the building tend to generate moisture? This is a critical question when determining the right type of roofing. What is the purpose of the building (what is it used for)? When to consider a repair. Not all problems are serious or critical, and cost may be a concern. If there is good insulation in the roof and the membrane is in good condition, you can repair to extend the life of the roof. Re-covering the roof may be the right solution if the membrane has met its life expectancy, and the roof has never been re-covered before and has good insulation. If there is a single membrane on the roof you may choose to top it with another one, particularly if your roof is basically sound. This is less costly than total replacement, less disruptive if you have occupants in the building, and reduces the risk of your roof sustaining damage when exposed to rain, wind and other elements of weather. Full replacement of the roof is recommended if more than a fourth of the roof is damaged and repairs are extensive. This is also the case if you want a long-term solution that utilizes the most up-to-date technologies or if the insulation in your roof is wet or not up to standard. While it is the most costly, replacing the roof will result in energy savings, lower maintenance costs and far fewer repairs. Additionally, if your roof has been re-covered in the past it cannot be re-covered again. In addition to the above options it may be possible to coat your roof. Our Atlanta commercial roof experts can help you decide if this is the right choice for your circumstances. At Kelco Roofing we specialize in commercial roof repair and installation in Atlanta and surrounding areas. When you have a problem, count on our professionals for the right solution, sound guidance and friendly service.